One of the things that annoys me most when reading recipes is the suggestion that onions can be caramelised in 15 minutes or less. Now…if you go back over some of my historic recipes I’m sure I’ve made this faux pas myself. But, I was young and naive. Forgive me. The fact of the matter is, if you want sweet, sticky, jammy onions that have truly been caramelised you’re going to have to put in the time. But, I’m pleased to tell you, it won’t actually involve any effort. 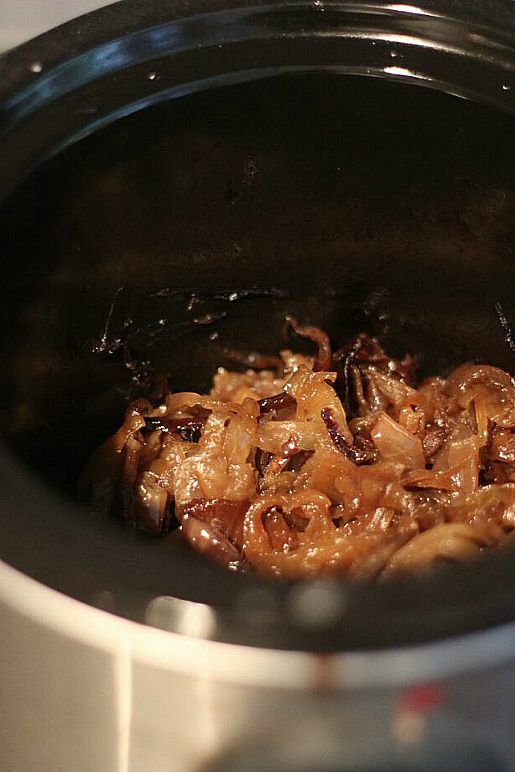 I’ve recently discovered that it is incredibly easy to make caramelised onions in your slow cooker – it’s so obvious when I say it now. Caramelised onions are traditionally made by heating the sliced onions in a little oil over a low heat for a long period of time until the natural sugars caramelise and the onions soften into that beautiful caramel brown. Of course low and slow cooking is exactly what the slow cooker was made for! What’s even better about this recipe is that it’s impossible to burn the onions! They can easily cook for 10 hours (or more) on your lowest setting meaning that they can easily be prepared overnight or while you are out at work, which is exactly what I did on Wednesday this week when I made my Butternut Squash, Goats Cheese and Caramelised Onion Tart! Peel and thinly slice all of the onions then cut into half moons. Place the onions in to the slow cooker so that it is roughly three quarters full. Add the olive oil and salt to the slow cooker ensuring all of the onions are coated. Set your slow cooker to the lowest setting, cover the slow cooker with the lid and cook for up to 10 hours on LOW. If you're around while the onions are cooking, stir them occasionally — this will help them cook more evenly, but don't panic if you are asleep / at work! After 10 hours, the onions should be be golden-brown and soft. There will probably be a lot of liquid which you can drain should you choose. For a more jam like texture, cook for another 2 to 3 hours on low with the lid askew. (Check the onions frequently during this time and stop cooking when you are happy with the consistency). 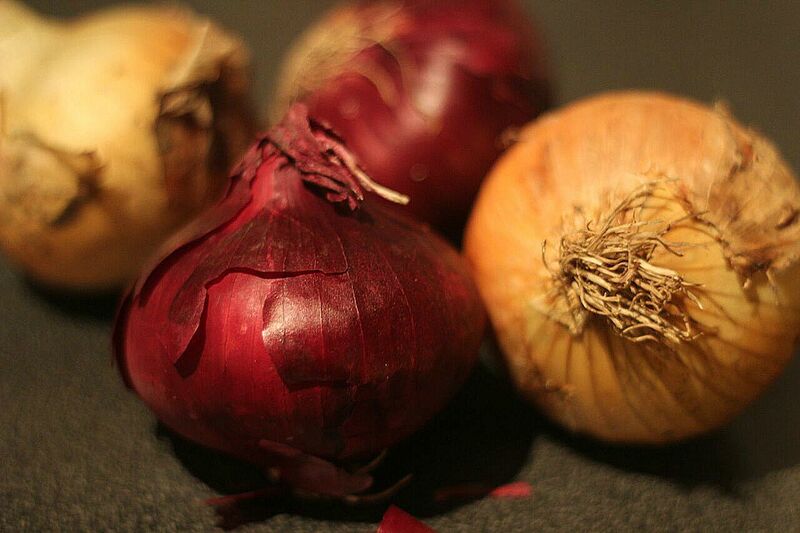 The onions will keep in the refrigerator for one week or in the freezer for at least 3 months. So now you can have sweet yet savoury, sticky and satisfying caramelised onions to top puff pastry tarts, burgers and hot dogs, pasta and more! It may seem excessive caramelising 4 or 5 onions at a time (or ten even if you want to double the recipe) but as they can easily be frozen in batches you’ll only have to make them once every few months. Simply thaw and re-heat before you want to use them! 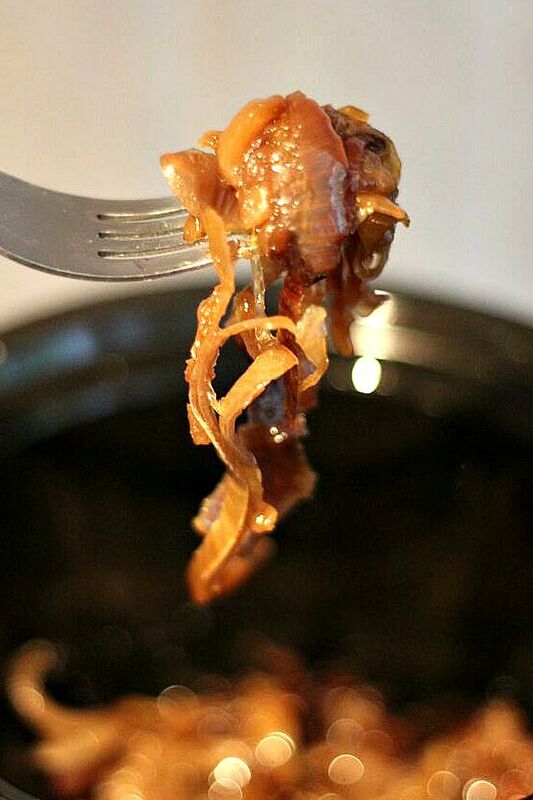 Made so many caramelised onions you don’t know what to do with them? Here is some inspiration! Ooh what a novel way do to onions. I like it. I also like the fab top photo which has given me an immediate craving for fried onions. Thanks for lining to one of my recipes. This is foolproof cooking – everyone needs life hacks like these! Thanks Snigdha. I couldn’t agree more. I wish I’d known this much sooner! Do you think these could be canned ? Caramelised onions are a low acid food so they would probably need to be pressure canned if you wanted to keep them for a long time. Freezing on the other hand is quick and doesn’t require any fancy technology! Do let me know if you have any more questions!